The audio not working is a bad sign in Windows that can usually be easily fixed. However, first of all, please make sure that you've gone through the Windows sound troubleshooter in the Help section of Windows before going through article. The Windows sound troubleshooter can probably fix your sound problems. -the volume is muted or really low which is a common source of the sound not working problem. -the song file you are trying to play is corrupt and this will also cause your audio not to work. -your sound cables are unplugged or not plugged into the right slots. -your soundcard driver is messed up (no sound can come out of a improperly configured driver). -you have a hardware conflict with two sound cards on your computer (sound conflict in your computer). -your computer does not have a sound card. -the sound card's driver is not installed on your computer (an audio driver needs to be installed). -your sound card is turned off in the BIOS, or your sound card is broken. Please note: If your audio is distorted or sounds strange, and you're still having the audio not working problem, check your computer's audio cables to make sure that they're tight, try your speakers or headphones on an MP3 player to see if you still have the problem (if you do, your headphones or speakers are broken), try playing a different sound file, inspect your audio cables to make sure they're not damaged, and check your sound card's control panel utility and sound player to see if you have messed up equalizer settings, bass boosters, virtual surround sound enhancements, etc. 1. 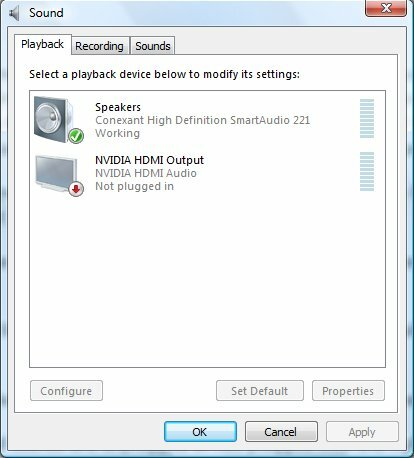 Restart your computer to see if that fixes the audio not working problem. Also, make sure that if you have speakers, that they are plugged in. 2. Check your computer's volume level and make sure it's high and not muted. Also, remember that if you're in a game, the game may be muting your sound and causing you difficulties. 3. Play a different sound file in case the one you're playing right now is corrupt. 4. Check your computer's audio cables to see if they are damaged or not tightly put into the sound ports. Also, if you have a sound card on one of your motherboard's ports, ensure that it is tightly fitted into the motherboard. 5. Check the ports your audio cables are plugged into to make sure they are they are the right ones (the pink audio port is usually for microphones and other sound input devices while the green audio port is usually for headphones or speakers and other sound output devices). This is one of the most common reasons why someone may be having the audio not working problem. 6. Try your headphones or speakers on another computer or mp3 player to see if they are broken. 7. Go into the computer's BIOS by pressing F2, F8, DEL or another key and then look around to see if your onboard sound card is disabled. Your audio will not work with no sound card! 8. Check if you have two sound cards (one on the motherboard and one in one of your motherboard's slots). If you do, you might have to remove the sound card in the motherboard's slot after first trying to disable the onboard sound to see if this fixes the problem and gets rid of any hardware conflicts on your computer. 9. Check the speaker's controls to make sure that they are also on medium volume. Also, if the speakers have a remote, check this to find out if it's muting any sounds coming out of the computer. 10. Your soundcard may not be configured to playback on your speakers. In Windows Vista, right click the volume icon in the notification area and select "Playback Devices". Choose a different playback device, click on "Set Default", and then click "OK" to close the dialog box. If this does not fix the audio not working problem, repeat these steps with a different playback device the next time. You can also right click the playback device and select "Properties" to check the playback device's levels tab, balance between left and right channels, enhancements and other settings. Close the dialog boxes when you are done. You can also click on the volume icon and click on "Mixer" to make sure that all your applications operate at a decent volume level. 11. Type the Windows key+R, type in devmgmt.msc and press enter to open Device Manager. Expand the "Sound, video, and game controllers" name to see if there's any question marks or anything at all. If there's question marks or a similar signal, you most likely have a sound card hardware or software conflict. If there's no devices at all, you probably don't even have a sound card on your computer. To fix hardware and software conflicts, try using system restore to set your computer back to a time when your sound did work. If your sound card still doesn't work, you may have other sound card driver problems. Right click on your computer's sound card and then click on "Update Driver Software" to see if you can find a better sound card driver on the internet to make your music work on your computer. You can also try disabling and then re-enabling your sound card by right clicking on your sound card in the Device Manager. Finally, try finding a utility for your sound card on your computer. If you do find one, try resetting your sound card to its default factory settings.